Include a few winning plants in your garden and containers this year. The 2019 All-America Selections flower winners are sure to brighten your landscape with minimal care. These plants are tested nationally and selected for their beauty and performance in gardens like yours. Here are just two of this year’s national flower winners. 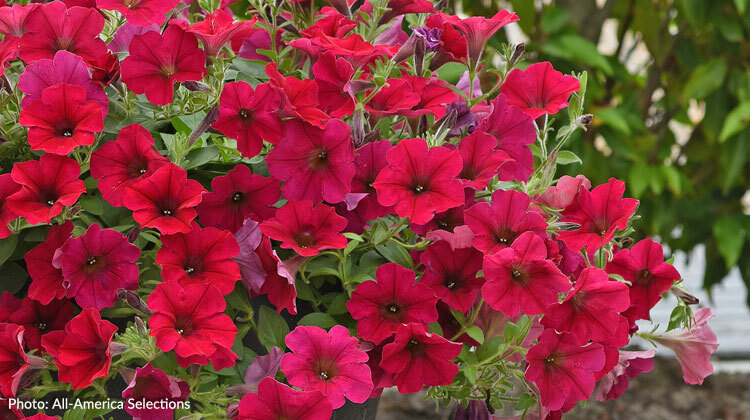 Carmine Velour Wave® petunia was one of the highest rated entries in the 2018 plant trials. The unique carmine rose flowers cover the easy-care spreading plant. It rarely needs deadheading as the new flowers emerge and cover the fading blossoms. The compact size, vibrant red flowers and uniquely colored deep bronze/brown leaves won the Viking XL Red on Chocolate begonia a spot on the 2019 winners list. Judges were impressed with the intense leaf color that remained sharp and bright all season long. A bit more information: All-America Selections is an independent non-profit trialing organization. They test new varieties for use in home gardens and containers.